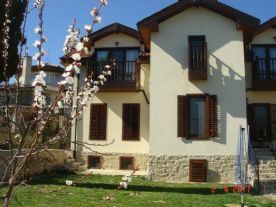 This is a beautifully restored 4/5 bedroom stone built house in the village of Galata on the Black Sea coast close to the port city of Varna. It was originally built around 1905 to a design by an Italian architect, and was the summer residence of the wealthy Varna family. The restoration has retained the character of the original house, with 60cm (3ft) thick walls on the ground floor. All of the woodwork has been replaced and extensive damproofing carried out and now offers modern standards of comfort, with full double glazing and central heating from a log-burning stove in the ground floor day room. 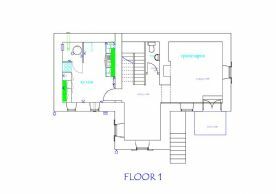 The ground floor (floor 1) consists of a porch leading to the day room, dining area and large kitchen with fully fitted kitchen with stone worktops. There is also a toilet/shower room. The staircase to the middle floor (floor 2) is in polished hardwood, as is the staircase to the top floor (floor 3). The main entrance is via an external stone staircase and glazed front door which opens into the hallway which has polished hardwood flooring. The hallway leads to the main two rooms on this floor, also with hardwood flooring, one of which is used as a bedroom, the other as the main living room but could be used as bedroom 5. There is also a toilet/shower room. 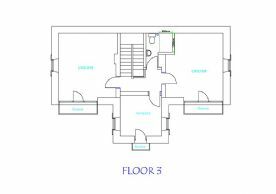 The top floor (floor 3) has two large double bedrooms which have large feature windows and balconies, and one single bedroom. These bedrooms all have wood panelled ceilings and hardwood flooring. 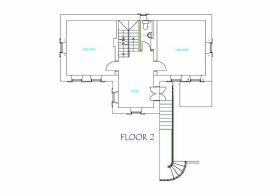 The main toilet/shower room is on this floor. Externally there is a large terraced garden with a stone patio, an external log store at the back of the house and concrete hardstanding for two cars, secured with a wrought iron fence and gates to the road. The garden is mainly laid to grass with a number of fruit trees including a productive fig tree. The house has the benefit of main drainage, mains water, electricity and broadband connection.